On Friday, August 9th, a stellar group of drummers across multiple genres will be performing in Downtown San Jose (including Chad Smith from the Red Hot Chili Peppers). For all the info, check out the press release below or head over to the event website over here! Chad Smith, Cindy Blackman-Santana & Jason Bittner will dazzle West Coast drummers in August! San Jose, Calif. – The editors of DRUM! Magazine have announced the all-star line-up of drumming clinicians that will appear at DRUM! Night 2013. Expect lots of chops to fly when Chad Smith (Red Hot Chili Peppers/Chickenfoot), Cindy Blackman-Santana (Lenny Kravitz/Santana),Jason Bittner (Shadows Fall/Anthrax), and Street Drum Corps take the stage at the San Jose Repertory Theatre on Friday, August 9. The star-studded roster of past DRUM! Night performers is proof of this proposition. Previous DRUM! Night festivals have featured living legends like Terry Bozzio, David Garibaldi, Kenny Aronoff, and Thomas Lang, as well as emerging hotshots like Thomas Pridgen, Queen Cora Dunham, Marco Minnemann, and Tim Yeung. In addition to this year’s incredible array of talent, DRUM! Night 2013 will feature a gear expo, raffle, silent auction, and presentation of the 2013 BADAAS (Bay Area Drummers Achievement Awards) trophy to a local drumming legend whose name will remain a secret until the onstage presentation of the award. Paul Bostaph of Slayer and Mike Bordin of Faith No More were the first two annual honorees. For more information and tickets, go to drumnight2013.com. And be sure to pick up a copy of the August issue of DRUM! to read our cover story featuring the stars of DRUM! Night. Chad Smith has played drums with The Red Hot Chili Peppers since 1988, appearing on every Chili Peppers album since the band’s 1989 breakthrough, Mother’s Milk. When not working with the Chili Peppers, Smith has remained busy with such side projects as the all-star band Chickenfoot and instrumental fusion outfit Chad Smith’s Bombastic Meatbats, as well as a long list of studio sessions with such diverse artists as Kid Rock, Glenn Hughes, Brandi Carlile, Johnny Cash, and The Dixie Chicks. Over the years, Smith has also contributed time to charitable causes including MusiCares, Make-A-Wish Foundation, and Children’s Hospitals, among others. One of the few drummers who is equally compelling in jazz or rock settings, Cindy Blackman-Santana began to turn heads after moving to New York City in the early ’80s, and within a short time started racking up credits with such jazz luminaries as Freddie Hubbard, Sam Rivers, and Jackie McLean. She released her first solo album, Arcane, in 1987, and has continued to enjoy a prolific solo career. Blackman-Santana elevated her profile considerably when she began playing with Lenny Kravitz in 1993, and continued to play with him until 2004, when she decided to focus on solo jazz projects like her recent Spectrum Road super-group with bassist Jack Bruce, guitarist Vernon Reid, and organist John Medeski. Best known as the hard-hitting drummer with Shadows Fall, Jason Bittner gained prominence in the early 2000s during the New Wave Of American Heavy Metal movement. 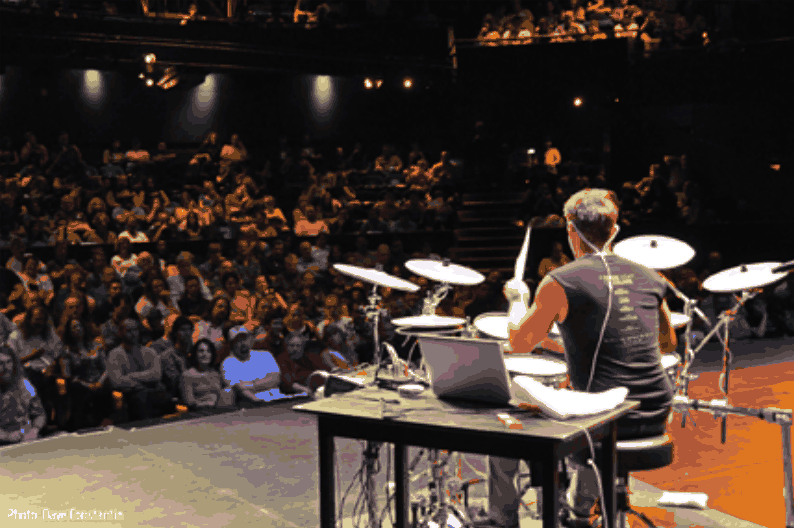 He has won multiple drumming awards, been featured on the cover of drumming magazines, and became a popular clinician at international drumming festivals. Bittner has twice toured with Anthrax, filling in for founding drummer Charlie Benante, and has developed a reputation as an educator through his work as a faculty member for the 2007 Drum Fantasy Camp, and with the release of his method book Drumming Out Of The Shadows and instructional DVD What Drives The Beat. Since their formation, Street Drum Corps has blown away audiences at nearly every major U.S. festival with their combination of thunderous percussion and visual stimuli. SDC’s shows are a primordial, stomping blast of energy, theatricality, and passion. There’s a reason why members of No Doubt, Bad Religion, and Projeckt Revolution tour mates Atreyu all want to play with them. Why Conan O’Brien invited them to perform on his show. And why The Used’s Bert McCracken has practically adopted them as his pet band. SDC are more concerned with rhythm than genre. In their performances, one hears tribal, rock, punk, dance, and industrial. Founded in San Jose, California, in 1992, Enter Music Publishing, Inc. is a leading publisher of cutting-edge drum and percussion magazines, with distribution in 40 countries. DRUM! is the flagship publication of Enter Music Publishing, Inc. and continues to set the industry standard for editorial quality and innovation. Enter Music Publishing, Inc. also publishes great content on its website, drummagazine.com. Over the company’s history, Enter Music Publishing has spearheaded other well-respected publications, such as How To Play Drums and TRAPS magazines. The company’s mission is to be the best source of drumming news and info on this planet. The company’s founders, Phil Hood and Andy Doerschuk, are well-respected drum industry veterans with more than 50 years of experience in the field.